Good afternoon sir/ma’am Im the architecture student who visited the capitol last week and asked about the zoning map of bohol but preferred to visit a target municipality instead and chose loon for my thesis about socialized housing. Unfortunately, the municipality doesnt have a zoning map as well do you have any similar map that i could use for my thesis that is related to zoning map of loon or even the entire bohol? Thank you so much for your response. For the municipal level, perhaps what you need is the Land Use Map and the Zoning Map contained in the Comprehensive Land Use Plan (CLUP), which you may find at the Municipal Planning and Development Coordinator’s (MPDC) Office. We do have a hard copy of Loon’s current CLUP but unfortunately, we can’t seem to find the Land Use Maps in our copy. 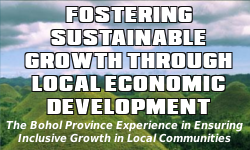 For the provincial level, the equivalent to a municipal CLUP would be the Provincial Development and Physical Framework Plan (PDPFP). It is composed of 4 volumes in which volume 3 contains maps which you might need, as well as the narratives, figures and tables in the other volumes. We hope you find these information useful for your endeavor and for the betterment of the Province of Bohol and its people. As we pointed out in our previous reply, for a provincial level, the equivalent document for a municipal CLUP is the PDPFP. For an equivalent to the Municipal Land Use Map please refer to the maps in the Development Maps section. These maps are part of the PDPFP. For certification about municipal concerns, the Provincial Government of Bohol has no jurisdiction on how the municipality intends to allocate the use of their lands. So you may have to secure that from the municipality concerned.